Many college and university student disability services that serve students with note taking accommodations have found great success in purchasing sets of Livescribe smartpens, 3D recording earbuds, and notebooks to check out to students within their program. Doing this enables these students to become more independent and successful note takers and improve learning and grades. In addition, since the ongoing cost of consumables (replacement notebooks and ink cartridges) is minimal compared to the cost of finding and paying note takers to take notes for students, colleges and universities are finding this to be a powerful way to both reduce costs and improve learning outcomes for students. We recommend watching the case study videos featuring student disability services and smartpen implementation to get a better idea of what adoption might look like at your campus. In addition, you can browse many more case study videos from student disability services departments at UC Berkeley, Wright State University, Arizona State University here. 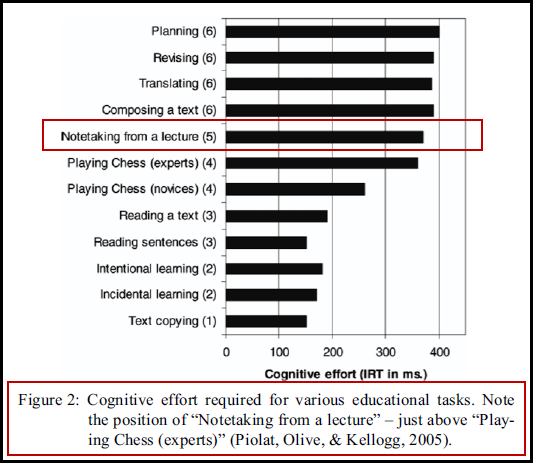 Show students that notetaking can be difficult for all students, as seen on the graph below from research that shows that note taking requires more cognitive effort than playing expert level chess (Piolat, Olive, & Kellogg, 2005). When you think about what a challenging task taking good notes is in the first place, it seems almost impossible when you throw in a variety of things that make it even more difficult - dysgraphia, dyslexia, ADHD, hearing difficulties, processing disorders, and more. Students should know that many students and professionals with and without learning disabilities use smartpens to help them take and review notes. Piolat, A., Olive, T., & Kellogg, R. T. (2005) Cognitive effort during note taking. Applied Cognitive Psychology, 19, 291-312. Students will benefit from participating in the self-paced Smartpen 101 course for initial product training on how to use the pen. This course is available free with all Educational Bundles purchased through Engaging Technologies. 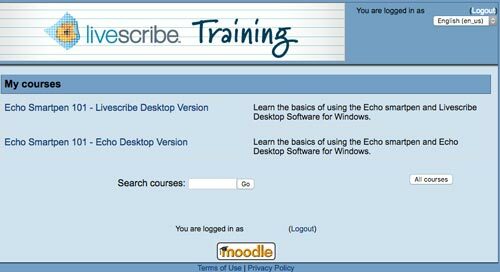 Courses are available for both Livescribe Desktop and the latest Echo Desktop. Each course consists of modules that contain written instruction, videos, and simulations to guide trainees through the basics of using the smartpen, followed by a module quiz. After all modules are completed with a quiz score of 85% or higher, a Certificate of Course Completion can be printed. This course is a great start for students to complete on their own before a face-to-face training with students that focuses on taking notes with their smartpen and offers some tips on note taking strategies that would be most effective with the Livescribe smartpen. This can also be done with a video like the one below. A follow-up training within a week to see how students are faring is recommended. Demonstrate the use and benefits of using smartpens and 3D recording earbuds to students and allow them to try a smartpen and view a pencast. This video is an excellent example of a customized getting-started video that can be made by someone in your student disability services program who is familiar with the Livescribe smartpen and can provide some great tips for using it to record classes on your campus. New technologies for learning also create new challenges. This is very evident with "smartpens" which capture a student's handwritten notes, record audio, and link the two together. Devices like Livescribe's Echo smartpen can be incredibly helpful to students with dysgraphia, slow auditory processing, and other issues that impact their ability to effectively take notes. Students can listen more, write less, and selectively review sections of the recording later by tapping their written notes with the pen. The challenge is the pen's ability to audio record, so laws or policies that specify what can and cannot be recorded in class apply. ...Concerns center around three issues: intellectual property, student confidentiality, and teacher rights." The article goes on to share some very helpful resources including an example of an agreement that some institutions may develop in regards to using recording devices as an accommodation. The University of Rochester's Center for Excellence in Teaching and Learning (CETL) offers a Livescribe Note Taking Service that includes information for students and professors as well as a simple Lecture Recording Agreement that serves the needs of both professors and students. 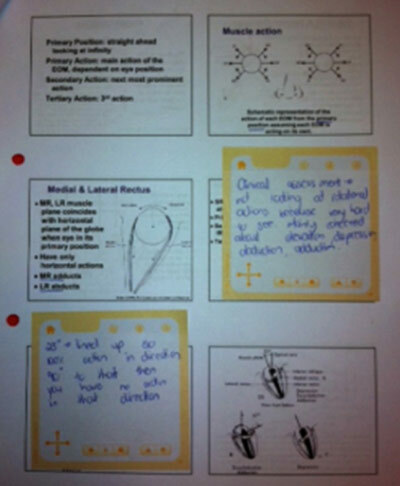 Students can create interactive audio study guides using the Print-on-Paper method or by adding audio to Livescribe Sticky Notes or removable/reusable Sound Stickers. This is a fantastic study technique that allows students to hear repeated audio as many times as necessary to obtain understanding or memorization of the concept. Students may be given PowerPoint slides handouts or other class handouts that their professors use as the basis for their lecture. If so, students can print these handouts on Livescribe dot paper carefully torn out of a large notebook and then add written notes while recording their professors lecture and class discussion. If students find it particularly difficult to take notes in a particular class (e.g., math, chemistry, physics), they may consider asking one of their classmates to take notes for them using their smartpen and earbuds. At the end of the class, the student should retrieve only the smartpen and 3D recording earbuds but tear out the notes from the Livescribe notebook and give them to the student who took the notes. Later, the student can view and replay the notes and get a printed copy of them too by simply docking their smartpen to their computer and using the Livescribe Echo software. Students can add Livescribe Sticky Notes with voice notes to textbooks, handouts, and more to add study value to them without damaging the textbook or handout. Livescribe sticky notes provide the same benefits as regular post-it notes; however, they have an added benefit of allowing audio to be added to them! The Livescribe sticky notes come in three different colors and two different sizes, so different colored sticky notes could be used for different things - one color for captured audio and a few notes, one color for questions, and one color for bright ideas. We want your ideas for more smartpen student disability services activities!